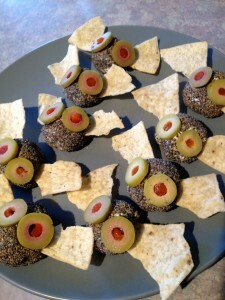 Each year for Halloween I love to dive into the food and all the creative ideas there are. 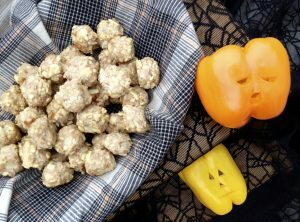 There are so many fabulous ideas on how to create spooky, fun and healthy meals and snacks that I often have a hard time picking just one. 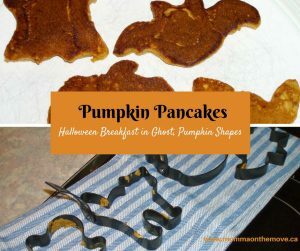 We usually have an entire day of Halloween meals and snacks, starting with pumpkin pancakes in the morning in fun Halloween shapes, then boo-nanas for snacks and something creative for supper. In the past I have made dinners such as monster face pizzas and hot dog mummies. Last year I happened to be at my girlfriends house just before Halloween and she had this cooking show on tv that was highlighting some spooky Halloween dinner ideas. 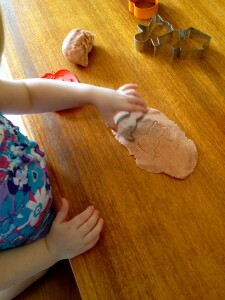 Of course they had lots of fun things going on but the one that stood out for me was the idea for Monster Brains. 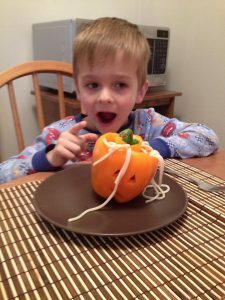 It is a super easy creative idea to make spaghetti and meatballs and give it a Halloween twist. I loved it! and decided right then that I was going to make it for Halloween dinner. 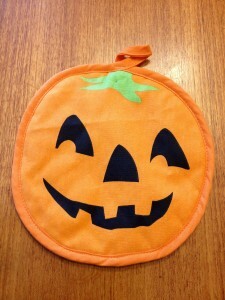 I was super excited as it was not only going to be fun but quick and easy to make. I am all about getting creative but sometimes I need creative to be fast! 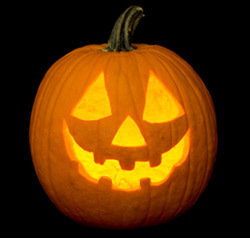 Cut off the top of your pepper like you would when carving a pumpkin – around the top in a circle so you can take the lid off. Clean out the seeds. 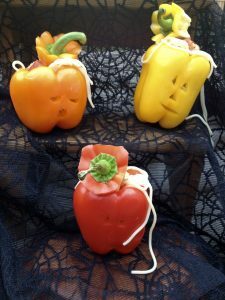 Cut a face on the front of your pepper. Design it any way you like. You can go with fancy but that takes more time! I went with simple triangle eyes, nose and slit mouth. Bake meatballs in oven (I make my own and premade these the day before and just reheated them). Cook spaghetti according to package directions. Rinse spaghetti with hot water in a colander. Fill each pepper with spaghetti and meatballs. 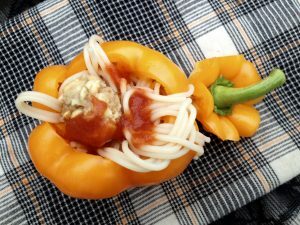 Top with tomato sauce and place ‘lid’ of pepper on top. Have some of the spaghetti spilling out the sides for effect. Voila! one spooky monster brain supper! My kids of course absolutely loved these and are already asking me if they can have that again for Halloween dinner this year. We may… or I may get creative and do something else! Yesterday many of us celebrated Pancake Tuesday. A tradition that began in the Middle Ages this day has grown and enjoyed by people around the world. Enjoying pancakes for supper is one of my favorite things (in fact I love anything breakfast for supper, there are so many fabulous breakfast foods out there) but on Pancake Tuesday I like to spice it up a little and make a recipe that is more than just your regular plain pancake – though those are just as delicious! There are so many kinds of pancakes to choose from. Some of our favorites are pumpkin and oatmeal banana. There are gluten free options, dairy free, coconut and fruit options. You name it, you can basically find it and make it. Yesterday I decided to try out an apple cinnamon pancake recipe (at the suggestion of my mother who was here on the weekend). I didn’t have one so I quickly googled it and found a number of apple cinnamon recipes to choose from. My favorite was on dairygoodness.ca, where they suggested using maple syrup as the sweetener as well as a mix of flours. Of course I had to make a couple of other quick substitutions to make it dairy free (as that is part of our diet as well) and went to work mixing up the dough. 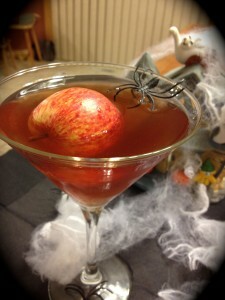 The most time consuming part was shredding the apples but otherwise is a quick and easy recipe to make. It was a huge hit! Everyone loved them. They had just the right amount of apple, not overwhelming and with a little bit of syrup…Yum! They were fabulous. My modified dairy and sugar free version is below. In a large bowl mix flours, baking powder, cinnamon and salt. In a separate bowl, mix eggs, almond milk, melted Earth Balance and maple syrup. Pour over dry ingredients and add apples. 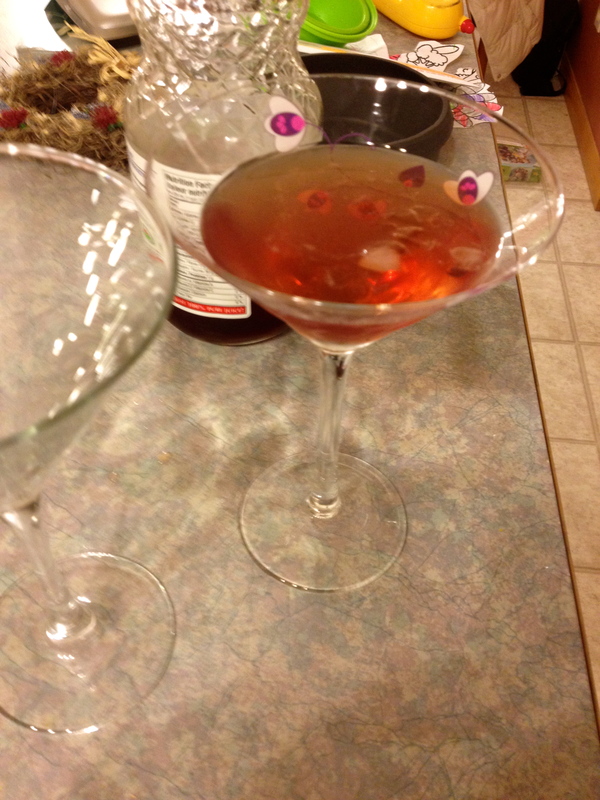 Stir gently until just combined – a few lumps may remain. In a large non stick skillet, heat a small amount of butter. Scoop about 1/3 c. of batter per pancake into skillet. Cook approximately 2 minutes or until bubbles form in batter. Turn over and cook 1 to 2 minutes more until golden and fluffy. Repeat with remaining pancake batter. I love that one night a year I can make pancakes for dinner! 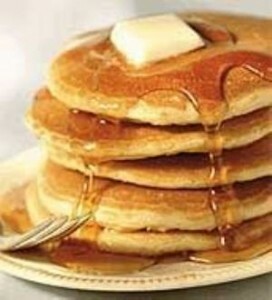 Shrove Tuesday or Pancake Day is the Tuesday before Ash Wednesday when Lent begins in the Christian faith. Beginning in the middle ages, it was the last day for celebration and feasting before the period of fasting required during the lenten season. Food items like meat, milk, eggs and fats were restricted during this time; so to keep these foods from being wasted people would have big feasts on Shrove Tuesday in order to consume these items and prevent them from being wasted (as they would not keep over the next 40 days). 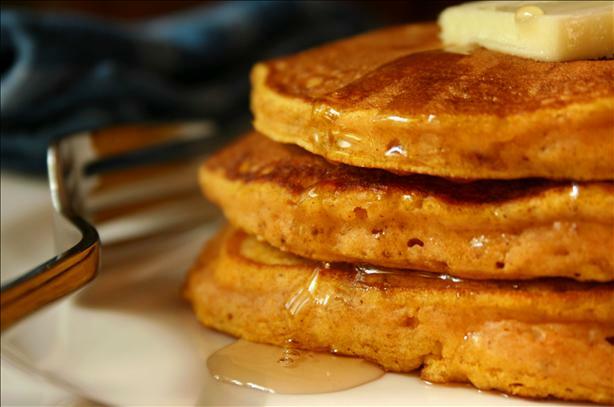 The English were the first to make pancakes on this Tuesday as it was an easy way to use these ingredients before Ash Wednesday began. 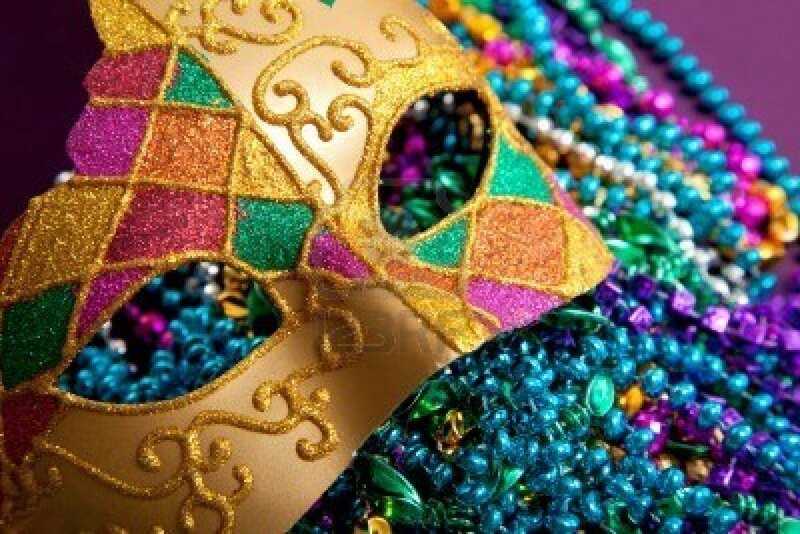 In France, consumption of these fats or fatty foods on this day coined the phrase “Fat Tuesday” or Mardi Gras. I always find these things fascinating and share them with my kids. 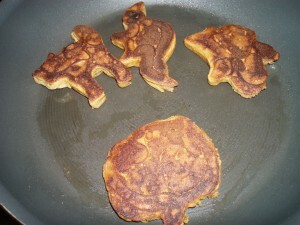 My oldest often asks why we have Pancake Tuesday and though I know the traditional reason I had no idea of it’s origin. And though we may not always observe all the traditions of the Christian faith we certainly enjoy and don’t mind observing this one! Usually I make the traditional plain pancakes and add some fruit on top, but with all our dietary changes and my hunt for new recipes, I have added to my repertoire of ‘kinds’ of pancakes. So today if you are on the hunt for a little variety in your pancakes, give one of these recipes a try (and if you are not making pancakes for dinner then try them some other time, they are all delicious!) 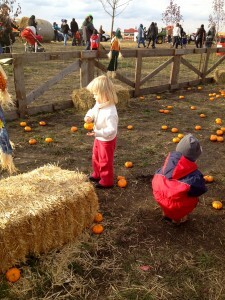 You’ll love ‘em and so will your kids. They are all sugar and dairy free and the last one is gluten free as well. 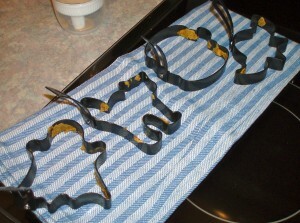 In a large bowl whisk together flour, sugar, baking powder, baking soda, salt, cinnamon, ginger and allspice. Set aside. Heat griddle over medium heat until a few drops of water flicked onto the surface skitter across it. Lightly grease the griddle. Pour 1/4 c. pancake batter onto griddle. Cook until bubbles form on top and the batter is set, 3 to 4 minutes. Flip the pancakes over. Cook until golden brown on the other side, about 3 minutes more. Keep warm until all pancakes are cooked. In a mixing bowl, combine both flours, baking soda and salt. Set aside. In a non-reactive mixing bowl, combine milk, oats and bananas. Fold in dry ingredients. Fold in egg whites and mix until just combined. Heat one teaspoon of oil in a 12-inch non-stick skilled over medium high heat. 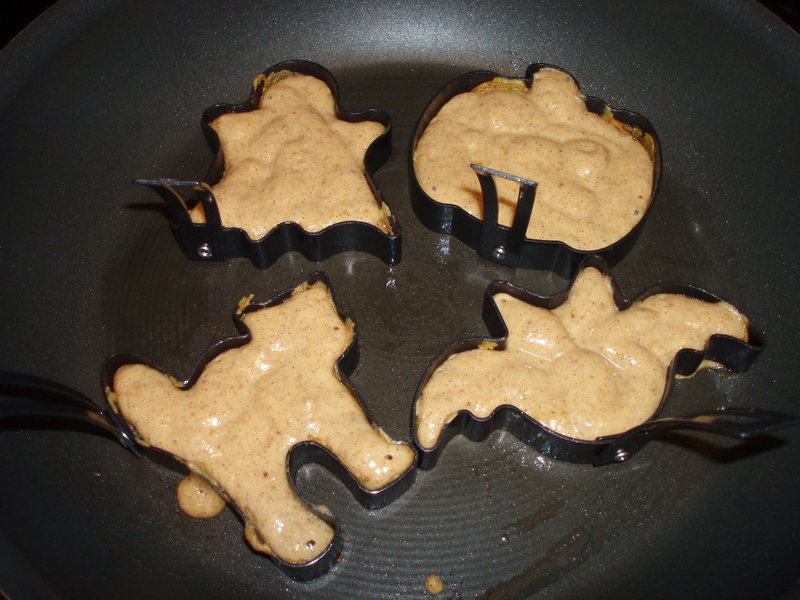 Drop batter by the scant ¼ cup full into pan and cook, turning once until lightly browned. 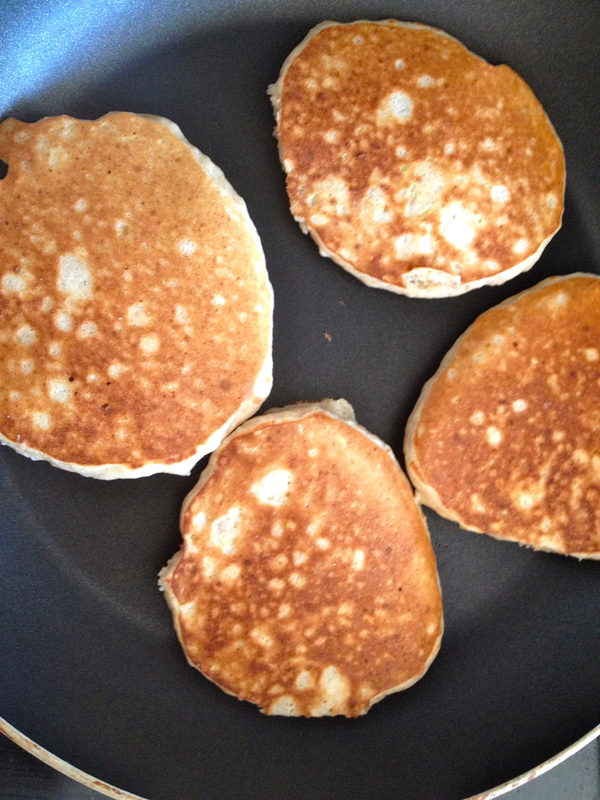 Hold pancakes warm on a platter until you’ve got them all cooked. Spread a teaspoon or so of peanut butter on each pancake and then the Pièce de résistance of course…a generous drizzle of maple syrup. 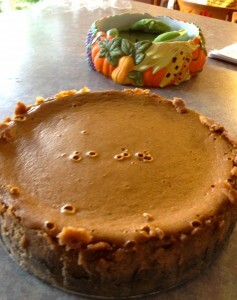 This recipe is sugar free, dairy free, gluten free and is yummy! Courtesy of Ryza rice milk. Beat egg until frothy. Add Ryza and oil; beat until well blended. In another bowl mix brown rice flour and the remaining dry ingredients. Make a well in the center of the dry ingredients and add the liquids. Stir until well blended. Do not over stir. Batter will be slightly thin. Lightly grease a frying pan. Pour small circles and fry pancakes until golden. 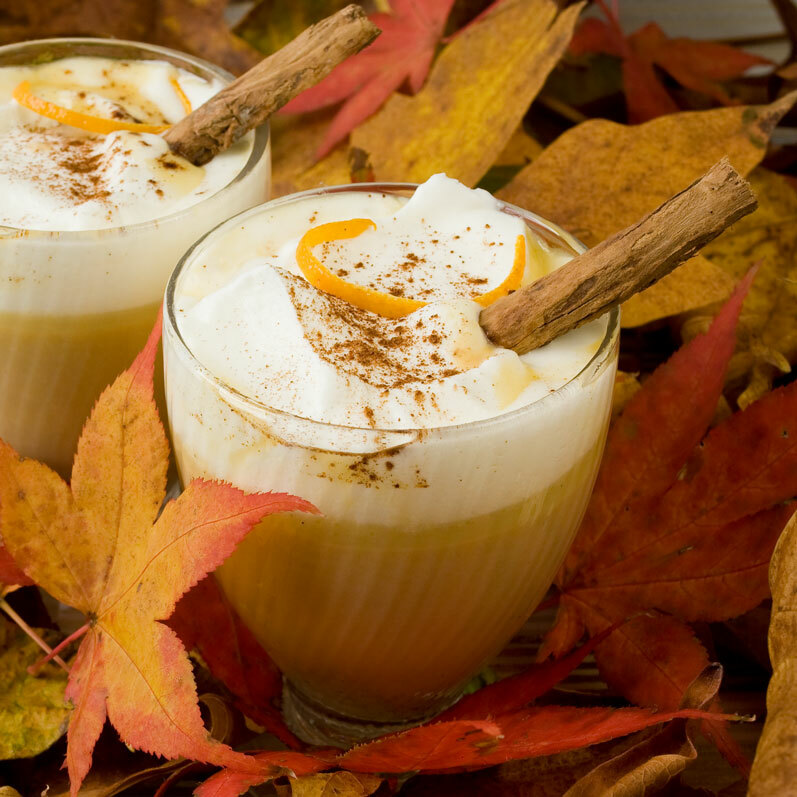 Serve with pure maple syrup. 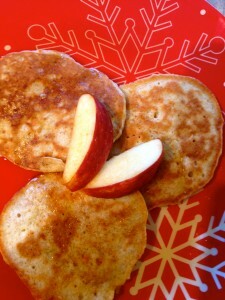 You can also try apple cinnamon pancakes or if you prefer a simple plain pancake try this recipe. What is your favorite pancake recipe? Share in the comments below.